Wealthy and spoiled socialite Layla Beck has been banished to rural West Virginia in 1938 to work on a project for the WPA—specifically, to write a history of the town of Macedonia. The indignity of being “on relief” is compounded by the fact that Layla is forced to board with the Romeyn family, who once ran the mill in town but have now dropped decidedly below their former upper-crust status. Layla’s assignment, while outwardly benign busywork intended to bore her into submission, sets her on a collision course with the Romeyns’ darkest secrets, and by the time the town’s history has been compiled, no one in Macedonia (including Layla herself) will ever be the same. 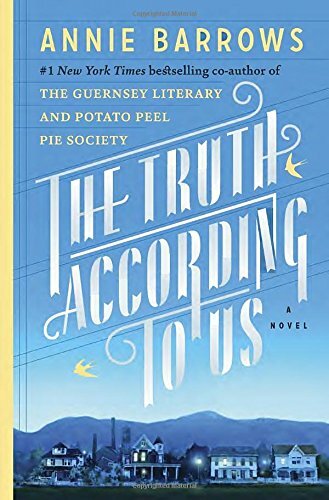 The Truth According to Us is Southern, summery, and folksy enough to put me in mind of To Kill a Mockingbird. Twelve-year-old Willa Romeyn is a precocious, Scout-like child narrator who, through her keen observation of adults, becomes a fount of profound wisdom about life by the final pages. Macedonia, West Virginia may not be exactly like Maycomb, Alabama, but it certainly has the requisite pariahs, judgmental housewives, and dirty laundry. Of course the obvious question that arises is: would any living writer really want his or her novel to recall Lee’s classic? Would you want your work sitting side by side in readers’ minds with a book read by every tenth-grader ever to enter an American classroom for the past half-century? If you like historical novels, The Truth According to Us is well-researched and funnier than most. If you can manage to block out any recollection of Jean Louise Finch, you’ll probably find it mighty enjoyable. With regards to Dial Press and NetGalley for the advance copy. On sale today, June 9!